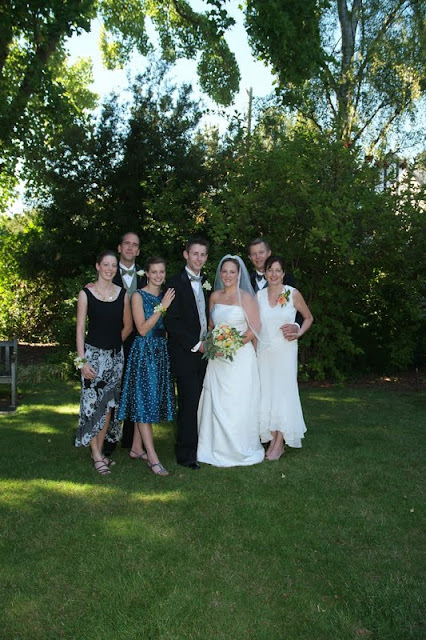 Five years ago, our family gathered to celebrate love and commitment. It was a beautiful day and a beautiful wedding. Our little family then. Families change over time, growing with love. Sometimes, it's hard not to look back and yearn over those days. But life moves on, bringing even more joy, and yes, difficulties, too. The groom in this photo had a little biking accident on the way home from work this week. He's now wearing, in place of a tux, an immobilizer, to help his newly RE-located DIS-located shoulder heal. 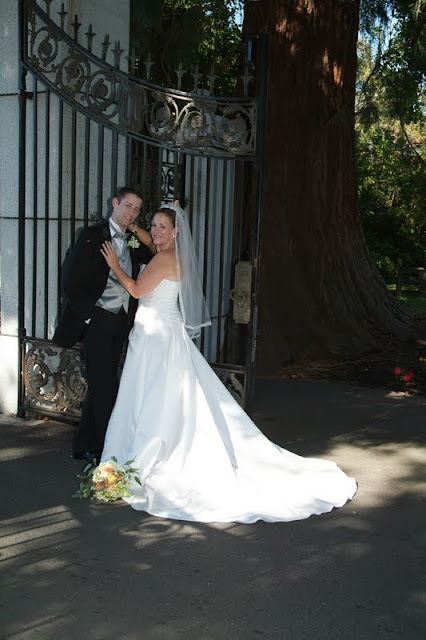 Happy Anniversary, Katie and Travis! Hope he will recover soon. What a way to spend an anniversary! Such a beautiful family you have, Lorrie & Tim. Your faces all shine with light and love. Praying Travis heals swiftly and wishing them a happy anniversary. What lovely memories of a happy day. I do hope he will be fit again soon, what a shame he had the accident. Hope he will be on the mend soon. Isn't it crazy how fast the years fly by? What a beautiful photo - I think I recognize those gates! Nice to see the great picture of your parents Lorrie. Your Mom does look wonderful and your Dad does too! Hoping that he will get well soon! Happy anniversary...and speedy recovery to the 'groom'! Beautiful wedding memories, hope Travis recovers soon. How's he going to hug her for the anniversary? Such a beautiful family photo. Happy anniversary and wishing the groom a very speedy recovery. Happy weekend. Prayers for quick healing. Beautiful photos.